In honor of October being Breast Cancer Awareness Month, the YMCA of DeKalb County presented a check to Francine’s Friends, Inc. in the amount of $1,565 raised at the 2016 Zumbathon with the help of Tri Kappa of Auburn. 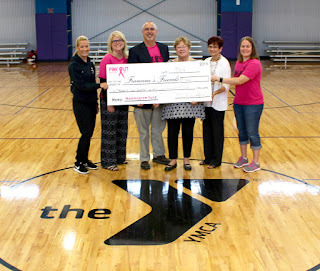 Pictured from left are Lynn Shonka (YMCA COO), Melissa Eshbach (Tri Kappa Member), Bob Krafft (YMCA CEO), Sharon Simmons (Francine’s Friends Board President), Glynda Harris (Francine’s Friends Board Vice President), and Anna Every (YMCA Wellness Coordinator). Photo courtesy of YMCA. Help Francine’s Friends Win $15,000! Just VOTE!